The Food Safety and Standards Authority of India (FSSAI) under the Ministry of Health and Family Welfare has invited online applications from eligible Indian nationals for multiple positions to be appointed at its Head Quarter in New Delhi and its regional offices in NewDelhi, Mumbai, Chennai, Kolkata and Guwahati through direct recruitment as well as on deputation basis. The application process towards the same will start from 26 January 2019 and will close on 25 February 2019. 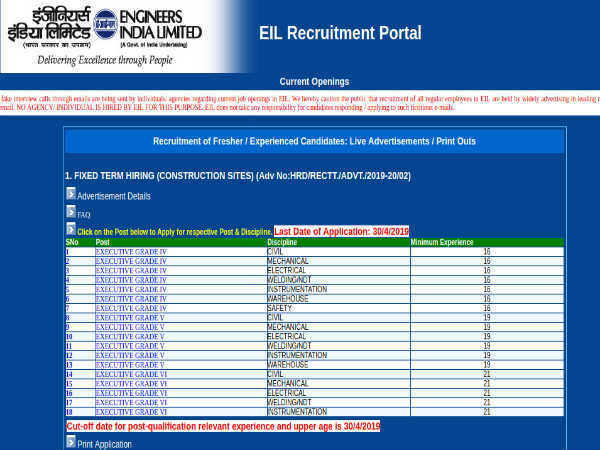 The selection through direct recruitment will be for posts comprising Director (4) Principal Manager (1), Joint Director (8), Deputy Director (8), Senior Manager-IT (1), Senior Manager (1), and Manager (3) totalling 26 vacancies, and the posts on deputation comprise Executive Director (2), Advisor (1), Director (7), Joint Director (12), Deputy Director (12), Assistant Director-Tech (18), Assistant Director-OL (01), Administrative Officer (22), Senior Private Secretary (7), Private Secretary (17), Senior Manager-IT (1), Manager-IT (2), Deputy Manager-IT (4), Assistant Manager-IT (1), Senior Manager (1), Manager (2) and Deputy Manager (4). Candidates interested in applying for the above positions through Direct Recruitment as well as Deputation basis through FSSAI Recruitment 2019 must not have exceeded 50 years of age as on 25 February 2019, with a relaxation in the upper age limit for reserved categories as per the FSSAI guidelines. For further details, refer to the notification given below. Candidates are required to deposit a prescribed amount of Rs. 1000/- (Gen/OBC) and Rs. 250/- (SC/ST/PWD/ Women) towards the application process through online (Internet Banking/Debit/Credit payment gateways) mode as well as other modes as specified in the notification. 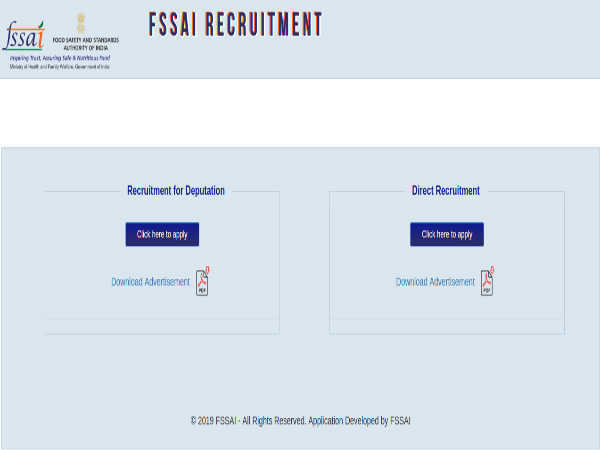 Candidates applying for multiple positions on Direct Recruitment as well as Deputation basis through FSSAI Recruitment 2019 must possess a Bachelor's Degree/B.E/B.Tech/ PhD/MBA/Diploma from a recognized University/Institution/Board in relevant disciplines/fields as specified in the notification against each post. The selection of candidates for multiple positions on Direct Recruitment as well as Deputation basis through FSSAI Recruitment 2019 will be done based on a written examination and personal interview as mentioned in the notification. Candidates selected for multiple positions on Direct Recruitment as well as Deputation basis will be paid under Pay Level ranging from Pay Level 7 to Pay Level 13.